It all began, as many things do, with a conversation in a bar. Last fall, Providence bartender Zahra Bates and I were at Sunny Spot on its opening weekend. At one point it occurred to us that quite a few Los Angeles bartenders express themselves creatively through painting, photography, music, and other arts when they’re not behind the stick. In fact, Sunny Spot’s own Brian Butler (an Otis College of Art and Design alum) is an illustrator and graphic designer. As the discussion continued, the list quickly grew to a few dozen bartenders: Eric Alperin (The Varnish) is a filmmaker; Steve Livigni (Harvard & Stone, La Descarga, et al.) is a DJ; Justin Pike (The Tasting Kitchen) has exhibited at Venice Art Walk. 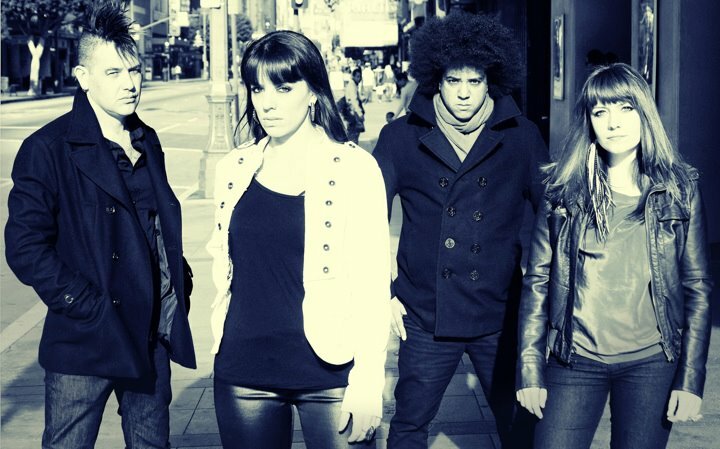 Every member of Mad Planet is a bartender: Cooper Gillespie (vocals/bass) and Monica Olive (synths) are at the Thirsty Crow, guitarist Tony Crouse is at Broadway Bar, and drummer Greg Gordon is at supperclub. And the band photo above? Taken by Geoffrey Smyser, who is also a bartender. 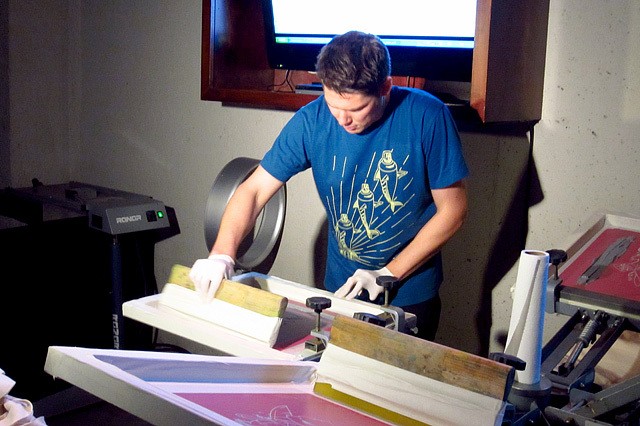 Seven Grand GM Angus McShane does silkscreening, as seen here at the dineLA launch party. 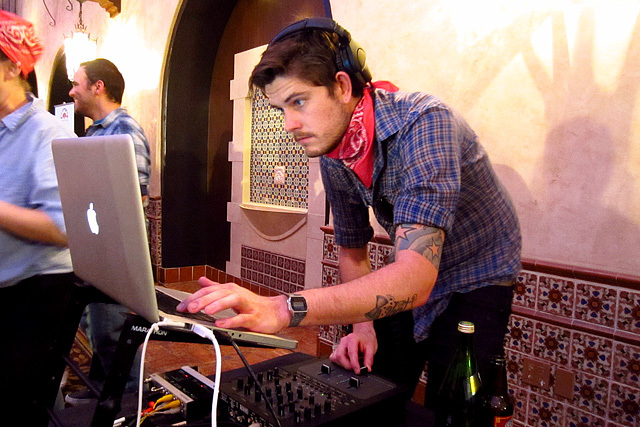 Dave Fernie of the upcoming Pour Vous kicks out the jams at Speed Rack LA. We realized there should be a showcase for all this artistic talent in the Los Angeles bartender community, and thus Art Beyond the Glass was born. At this event, everything from the cocktails to the art hanging on the walls and the music coming out of the speakers will be created or performed by LA bartenders. Art Beyond the Glass will take place on Sunday, June 17th. The location is TBD as this post goes live, so stay tuned as details are announced. This GOOD Education article describes Inner-City Arts as “one of the most effective arts education entities in the nation, [offering] an immersive artistic experience to every Los Angeles public school student, regardless of ability to pay.” Check out the GOOD video below, and you’ll see why we’re very excited that Art Beyond the Glass will be raising funds for Inner-City Arts. For more information about Inner-City Arts, visit www.inner-cityarts.org. Whatever the topic, any discussion involving bartenders and cocktail culture is bound to include Dale DeGroff, and it comes as no surprise that King Cocktail is showcasing his own art beyond the glass with On the Town: a Tribute to Bars, Speaks, and Legendary Saloons. During On the Town, the James Beard award-winning mixologist and author sings tunes from the Great American Songbook and traces the colorful history of the cocktail with music, stories, and classic cocktails. On the Town will be performed in several different cities over the coming weeks, including Washington DC, Boston, Philadelphia, New Brunswick, and New York. 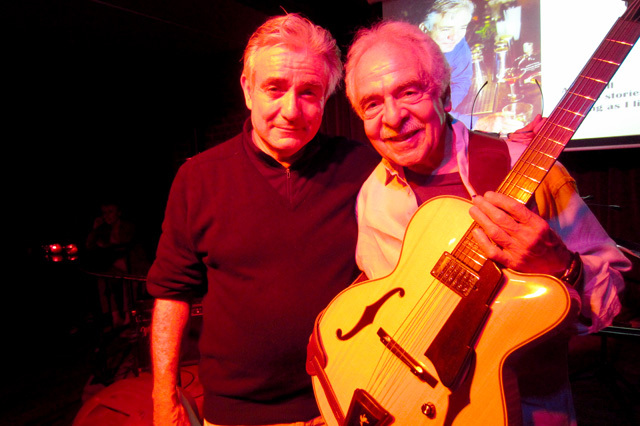 The Los Angeles stop for On the Town was at Casey’s Irish Pub, where DeGroff was accompanied by renowned jazz guitarist John Pisano, one of the founding members of the Tijuana Brass. In DC, DeGroff will be joined by piano virtuoso Dan Ruskin. 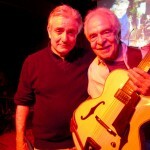 The NY, NJ and Philadelphia shows will feature jazz great Joel Perry. Proceeds from On the Town benefit the Museum of the American Cocktail (MOTAC), which is currently seeking a new home. On the Town is well worth the price of admission: not only are you supporting MOTAC, but you get to enjoy great music, receive a fun and informative primer on the history of the cocktail, and sip classic cocktails. For more info and to purchase tickets to On the Town, visit www.kingcocktail.com/onthetown.htm.